The rate of cryptocurrency expansion is accelerating beyond even the most optimistic of predictions. 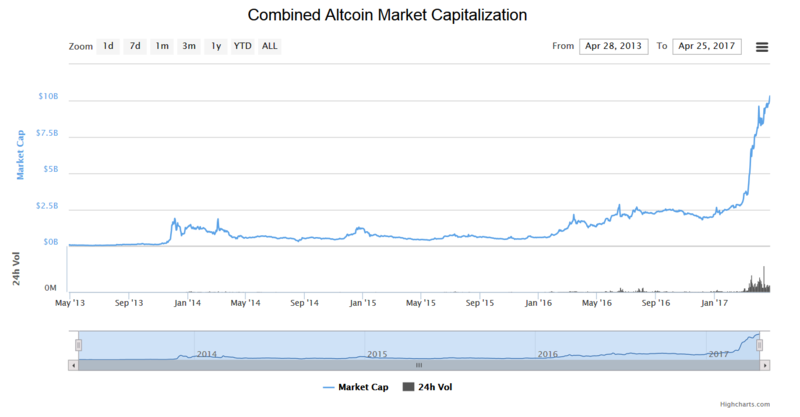 The total Altcoin market capitalization has just passed $10 billion which is roughly 4x higher than 2 months ago. We are witnessing History in the making -- a complete rewrite to the way money is understood and recognized! We just keep on growing and expanding. It's not entirely smooth and comes in fits and starts but as long as we keep growing, we'll reach the stars.